Percy Harvin is an example of pure athleticism, and follows the NFL trend of other multi-threat athletes, like Randall Cobb, DeSean Jackson and Antonio Brown. The speedy receiver has battled injuries and ailments throughout his career, but has the potential to be a featured component of the Seattle offense. This high ceiling makes Percy Harvin cards and autographs an interesting investment for collectors, and someone to keep an eye on in the future. 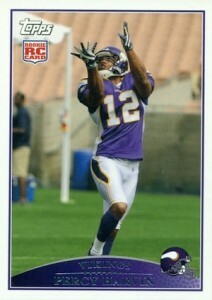 Shop for Percy Harvin Cards on eBay. Born and raised in Virginia, Percy Harvin decided to attend the University of Florida to play college football. Harvin was part of the 2007 and 2009 NCAA National Championship teams and was a main feature of the 2009 Gators offense, at both receiver and running back, as well as a standout returner on special teams. Following his Junior year, Percy Harvin declared his intention to enter the NFL Draft. A positive drug test at the NFL combine likely resulted in a drop in the draft, but the Minnesota Vikings were thrilled to select him in the first round with the 22nd pick. Paired with Brett Favre to start his NFL career, Percy Harvin got off to a fast start. He broke the Minnesota Vikings team record for all-purpose yards in a season and was named the Offensive Rookie of the Year. From there, Harvin continued to put up good numbers whenever he played, but a variety of ailments, notably an ongoing migraine condition, caused him to miss multiple games in his first two seasons. He finally seemed to turn the corner in 2011, and was active in all 16 games. Building on that, 2012 looked to be his big breakout year and Percy Harvin was heavily featured in the Vikings offense for the first half of the season. However, a severe ankle injury caused him to miss the last eight games, and required him to have surgery. Percy Harvin was traded to the Seattle Seahawks for several picks and signed a new deal with the team. Unfortunately, his injury woes followed him to Seattle and a partially torn labrum and the resulting surgery required him to miss most of the 2013 regular season. Despite not having much playing time to shake off the rust and missing the NFC Championship game because of a concussion, Percy Harvin showed how dangerous he could be when he returned a kickoff 87 yards for a touchdown in the Super Bowl. Although he remained mostly healthy in 2014, halfway through the season, the Seattle Seahawks reportedly traded him to the New York Jets. 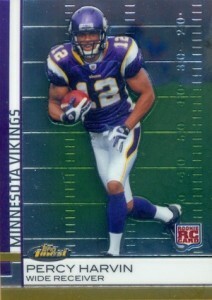 With 40 rookie cards to pick from, there are plenty of choices for Percy Harvin card collectors. Three signed versions stick out at the top, but there are many other autographed options available. The full checklist can be seen on next tab. 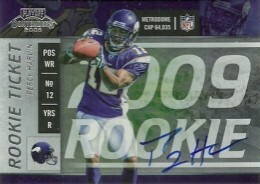 Even with a higher print run, the Percy Harvin rookie found in 2009 Exquisite Collection is the number one option for collectors. A large jersey piece and on-card signature combined with the ornate design lock it into the top spot. Even though the print run is only 99, the busy design and forced feel of the layout brings the National Treasures rookie card down a level. The on-card signature and jersey piece still make it an appealing card whenever one surfaces. 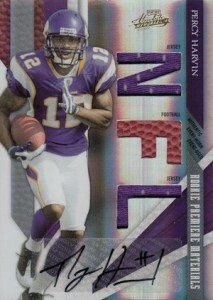 Rookie football collectors love Contenders and this trend continues with Percy Harvin rookie cards. The announced print run is just under 500, but collectors don't seem to mind and have made this autographed card one of the most popular Percy Harvin rookie cards available. 2002 Upper Deck Graded Keyshawn Johnson #G1-KJ 02 15 College Jersey Card JK5.